Pope Announces 20 New Cardinals, With Homelands From Myanmar To Mexico : The Two-Way Some of the prelates come from countries that have never before been represented at such a high level in the Catholic Church — including Tonga and Cape Verde. 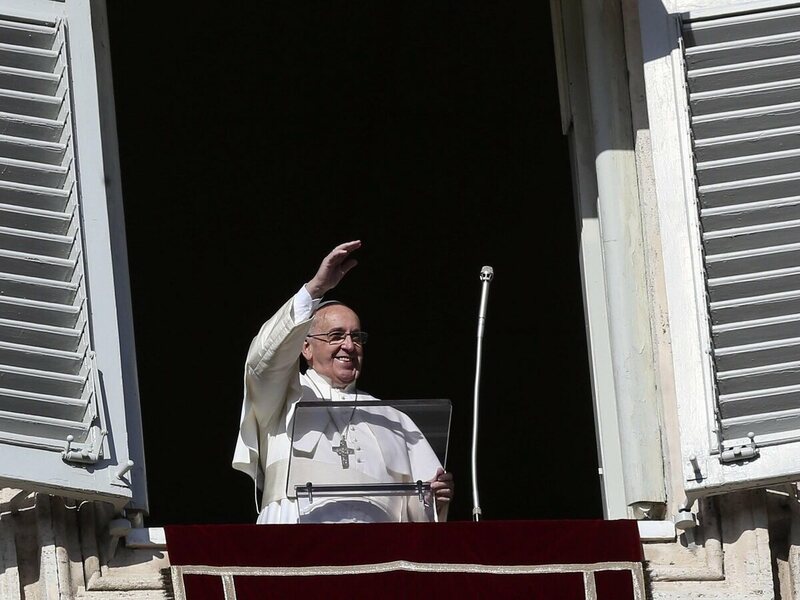 Pope Francis waves from the window of his rooms at the Vatican to faithful at St. Peter's Square at his Sunday Angelus prayer at the Vatican City on Sunday. In a further sign that Pope Francis is intent on shaping a Church that looks like the world, the pontiff announced today the selection of 20 new cardinals from 18 different countries, including several from Asia, Africa and Oceania. "Of Francis' 20 choices Sunday, seven come from Europe, five from Latin America, three from Asia, three from Africa, and two from Oceania. There are none from the United States or Canada. "Three come from countries that have never had a cardinal: Bishop Arlindo Gomes Furtado, of the Atlantic Ocean archipelago of [Cape] Verde [islands]; Bishop Soane Patita Paini Mafi, of the Pacific Ocean archipelago of Tonga; and Archbishop Charles Maung Bo, of Myanmar." Others hail from Portugal, Italy, France, Mexico, Uruguay. Spain, Panama, New Zealand, Thailand, Vietnam and Ethiopia. Only one of them, a Moroccan native, is drawn from the Vatican bureaucracy. The new cardinals come from "every continent, to manifest the indissoluble links between the Church of Rome and the particular churches present in the world," the pope said in the announcement at his weekly prayer and blessing in St. Peter's Square. The new picks will be installed on Feb. 14. Vatican spokesman Father Federico Lombardi said no cardinals were chosen from North America because the region is already well represented. He also said the pope does not feel chained to the tradition that major cities must automatically have cardinals to lead them. "The new nominations confirm that the pope is not bound to the traditions of the Cardinalatial Sees which were motivated by historical reasons in different countries in which the Cardinalate was considered almost automatically connected to such sees," Lombardi said. "Instead, we have several nominations of Archbishops and Bishops of sees that in the past have not had a Cardinal." NPR's Sylvia Poggioli, reporting from Rome, explains that five of the 20 new prelates are over the age of 80 and were chosen as a reward for long service. They are not eligible to vote for the next pope. "The 15 younger cardinals will chose Francis' successor — deciding whether the Argentine pope's reforming legacy will be lasting," Sylvia says. "With the addition of the 20 new cardinals, the College of Cardinals now numbers 228, including 103 who are over 80. "Last year, Francis named 19 cardinals, predominantly from countries in the Southern Hemisphere."